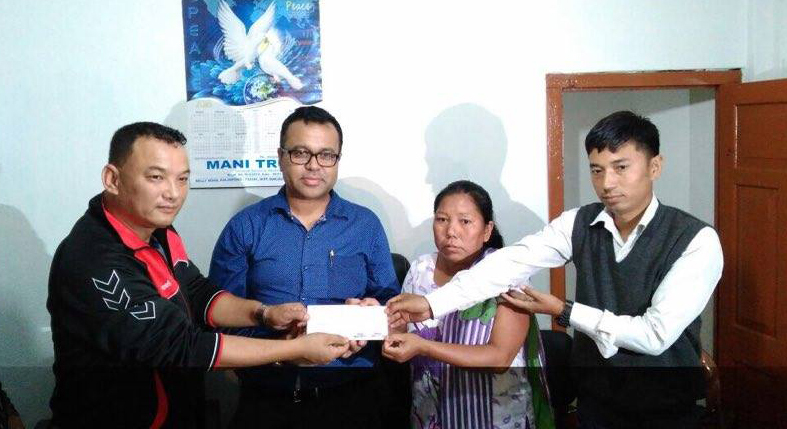 MANI TRUST, a Public Charitable Trust today handed over a cheque of 2 lakh 47 thousand 753 rupees to Mina kumari Bhujel of Kashyem Cinchona Plantation. The trust which was established on the 28th of May, 2014 with a aim to mitigate the plight of the living standards of people residing in the hills of Darjeeling District in terms of health, environment, education, along with social and economical aspects is engaged to raise donation for drown trodden patient under Support for life initiative. The Trust was approached by Darjeeling Terai Duars Plantation Labour Union few weeks ago appealing to raise Fund for Kamal Bhujel a labour of plantation who is suffering from Cancer called Sarcoma on his left thigh in his leg and is presently admitted in CMC Vellore .Now the disease has infected his lungs due to which he can't walk and have breathing problem informed Mina Subba the wife which thanked the trust for the financial help which was need for treatment. Subash Singh ,the chairman of Mani Trust informed that the 12 days Donation Camp from 21/6/2016 to 2/7/2016 was held in aid of Cancer Patient Mr. Kamal Bhujel resident of Kashyem, Munsong G.C.P, Kalimpong in Kalimpong Town with due permission from the Chairperson, Kalimpong Municipality. People from Rs 1 to above donated a total sum of Rs.2 lakhs 40 thousand and 753 ruprees. He informed that Mani trust too appealed to public through its page where 3 donor came one gave 5000 and two thousand each which make the total of Rs2,47,753. He informed that the Trust bears all the expenses during the camp. A sum of 3 lakhs 40 thousand is needed to operate Kamal. We have raised the sum and the rest need we will apply to PM and CM relief fund, Ambedkar Foundation, SC ST commission informed Subash Singh who was recently appointed the National Chairman of National Confederation of Dalit Organisations (NACDOR). He thanked all the donors and volunteer for Munsong church and Cinchona Yuwa Pariwar specially students from Munsong High School for making the fund raising initiative a grand success. The 161 pages of detail donation collection report was handed to Ravi Pradhan ward councilor of ward no 10 along with Yogesh Tamang Secretary of DTDPLU in presence of Trustees of Mani Trust. The report will be send to SDO Kalimpong, IC Kalimpong informed Singh. Mani Trust which has been regularly supplying home cooked food and water containing 60-70 calories to homeless people of Kalimpong from 29th May 2014 under its food for helpless initiative. The trust distributed English, Hindi, Nepali and Bengali news paper to three parks of Kalimpong town under Social Information Promotion initiative. It is engaged to raise donation for drown trodden patient under Support for life initiative. The trust in a very little time has been emerging as a raising force. The Trust is working to establish a Medical Tourism Hub in Kalimpong and reviving the glory of Kalimpong Arts and Craft he informed. 0 Respones to "Mani Trust hand over 2.47 lakh to cancer patient"